I have a position in natural gas futures right now. I have bought the January contract of natural gas at 3.565. I entered the position at 10:47 in the morning. Before I get into this trade, I'll briefly mention an update in my gold trade from November 29. I got stopped out of this trade on Friday, November 30. 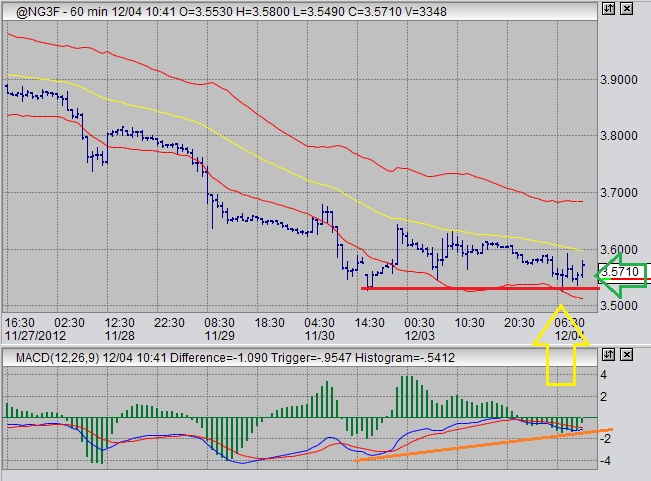 My big mistake was not waiting for that MACD divergence to occur on the 60 minute chart. Today we are seeing a decline, and I anticipate a possible new buy opportunity to show itself soon. I will be watching gold with the intent of getting long. I will also write a brief blurb about sugar futures at the end of this page. Let us look at a 60 minute chart for January the natural gas contract. I have drawn in some lines indicating an MACD divergence. As always, I have implemented a stop-loss exit strategy in case of trade failure. I entered at 3.565, and I am anticipating a good rise lasting into the better part of next week. Unless I get stopped out, naturally, in that case I will anticipate nothing. That is where I stand for natural gas futures trading at this time. I have been bullish on sugar futures for a while now, but a decent entry point has neglected to show itself. I am growing increasingly bullish in this market. I feel like the buy signal I have been waiting for may show itself soon. I am watching this market quite closely on all time frames (60 minute charts to monthly charts). I want to be very aware of market behavior in these coming days and weeks. If we were to get a strong buy signal on a daily time frame in the next month, or so, then I would be very inclined to think that we could see a rather substantial run in prices over several months. A strong bullish signal at this time, would have me quite ready to enter expectant of an upward price dynamic. I will chronicle any developments in this futures blog.